You can read the updated, latest report on customer lifetime value here. Every business manager knows that when a customer has a problem, the experience of resolving the issue has a profound impact on future purchases. This effect has been amplified as social media and web review sites enable customer service experiences to be widely shared with friends, colleagues, and the general public. But just how impactful are these customer service experiences on buying behavior and the lifetime value of a customer? How long does the effect last? And what is the impact for mid-sized companies? The following report is based on a survey of 1046 individuals who have had experiences with the customer service of a mid-sized company. The survey's main intent was to quantify the long term impact of customer service on business results. The survey was conducted by Dimensional Research, an independent market research company specializing in technology. This survey clearly demonstrates that customer service has a dramatic impact on the buying behaviors among customers of mid-sized companies. Good customer service results in increased personal and business purchases while bad customer service drives customers to find alternatives. Interestingly, customer service experiences are judged more on the timeliness of the interaction than on the final outcome. Customer service has a long-term impact on buying decisions, with customers continuing to be effected years after the initial interaction. Customers share service interactions more widely than ever before. Social media and review sites are providing increased awareness of customer service experiences, and these stories influence the purchases of others. Participants were asked to rank a series of factors in the order in which they impact the level of trust they have in their vendors. Excellence in customer service ranked as the #1 factor that most impacted participants. Participants were asked if they had experienced any good customer service interactions with mid-sized companies, and then asked the same question about bad customer service interactions. The vast majority of participants recalled good experiences (95%). More than half (54%) reported having bad customer service experiences with mid-level companies. Survey participants who had indicated they had a good customer service experience were asked what specifically made that experience good. The most important factor cited by participants was a quick resolution of the problem (69%) followed by being helped by a pleasant person (65%). Interestingly, the actual outcome of the problem was least important with less than half (47%) indicating that their customer service interaction was good because of the outcome. Similarly, survey participants who had indicated they had a bad customer service experience were asked what specifically made that experience so bad. The most important factor cited by participants was needing to explain their problem to multiple people (72%), followed by having to deal with an unpleasant service person (67%). Only half (51%) felt that their customer service interaction was bad because the problem was not resolved. Among participants that had experienced good customer service, most of them (83%) reported that their behavior changed in some way as a result. 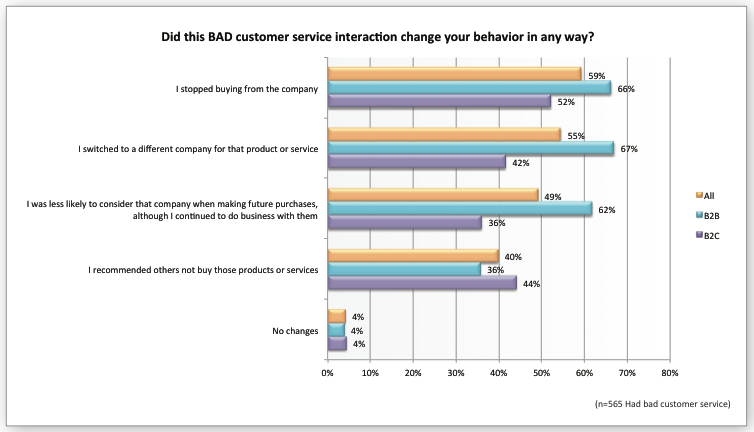 The most common way that their behavior changed was that they purchased more from that company (52%). Participants receiving customer service from B2B companies were significantly more likely to increase their purchases as a result of good customer service (62%), compared to those who dealt with B2C companies (42%). While fewer participants reported a bad customer service experience with a mid-sized company, they were much more likely to change their behavior if it happened (96%). Simply not buying from the company in the future was the most typical response (59%). 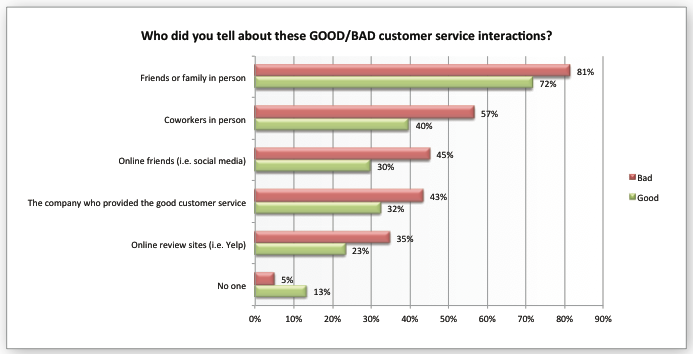 Interestingly, the reactions to bad customer service reactions differed between business and personal experiences. Those who had a bad customer service experience in a business context were much more likely to stop buying from the company (66%) than when it was a case of personal use (52%). Conversely, those who had a bad customer service experience for a personal product or service were more likely to recommend others not buy the product (44%) compared to business purchasers (36%). Participants were asked how long ago it was that these customer service experiences happened. In this question, they were asked specifically to think about that experience with the mid-sized B2B or B2C company whose good or bad customer service impacted their buying behavior. Bad customer service experiences were more long lasting. Over one third of participants, 39%, continued to change their buying behavior more than two years after the negative incident had occurred. Good customer service also resulted in long term impacts, with about one quarter (24%) saying that they continued to change their buying behavior based on a positive customer service incident that happened more than two years ago. Certain segments of the market had particularly long memories. The participants most likely to say they were still influenced by a bad customer service experience that happened two or more years included women (45%), those who received customer service for business (51%), and Gen X (54%). Those with household incomes exceeding $150,000 per year had the longest memories for bad customer service experiences (79%). Participants also reported broad use of social media (45% for bad and 30% for good) and online review sites (35% for bad and 23% for good) to spread stories about customer service experiences. 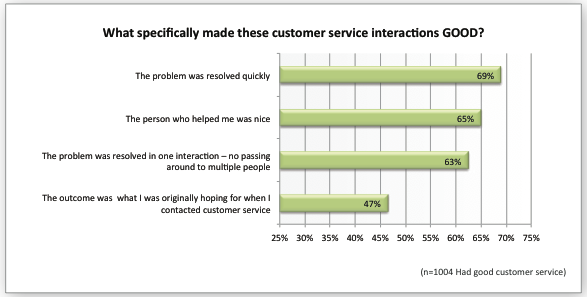 Certain segments of the market were much more likely to share their customer service stories with others. Those who received support in a business context, participants from Generation X and the wealthiest participants shared the most information with their personal and online networks. 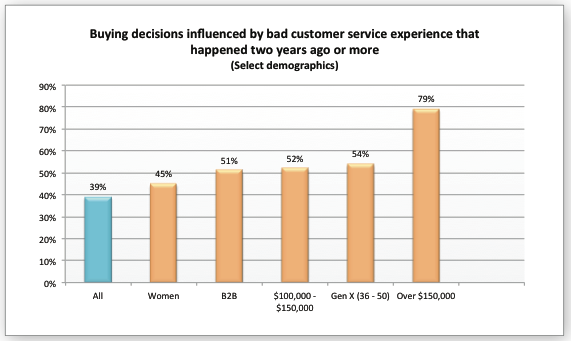 Among those earning more than $150,000 a year, a remarkable 100% had shared their bad customer experiences with others! However, all these segments took a balanced approach and also shared their good experiences more frequently. When these stories were told, they were often repeated many times. The survey participants who indicated they had shared their good or bad customer service experiences with others were asked how frequently they had told their story. 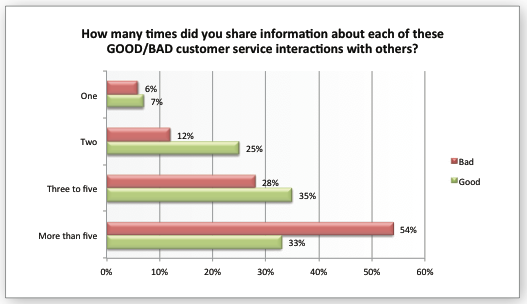 More than half, 54%, indicated that they had shared their bad customer service interaction story with more than five people. All survey participants were asked if they were more or less likely to tell others about their customer services experiences. More than half (58%) reported that they were more likely to share their experiences. 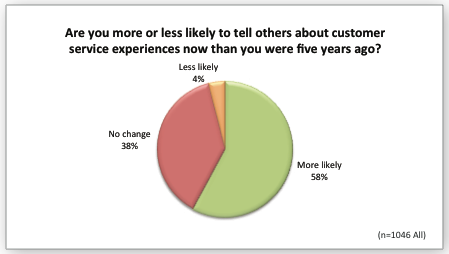 A very small number (4%) were less likely to share customer service stories now than they were five years ago. The biggest differences in participant answers for this question occurred between the generations. Baby Boomers were the generation that changed the least over the past five years while Gen X tells more customer service experiences now. Among the Millennials, 9% claimed they were actually less likely to share customer service experiences now than they were five years ago, more than any other segment. All survey participants were asked if they had seen online reviews of customer service. About two-thirds of participants (63% for negative and 69% for positive) reported that they did recall reading these online reviews. Review sites were the most common place to read a negative review of customer service (39%) where Facebook was the most common place to read a positive review of customer service (44%). These reviews are very impactful. 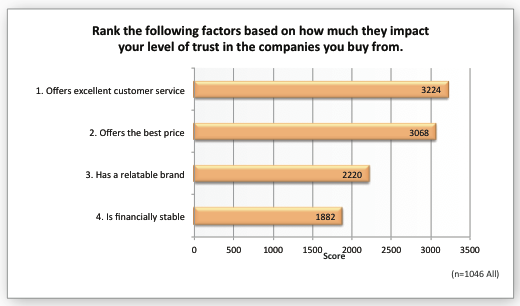 The vast majority of participants who have seen reviews claimed that that information did impact their buying decisions. This was true of both positive reviews (90%) as well as negative reviews (86%). In early 2013, 1046 individuals completed an online survey about their experiences with customer service. All participants lived in the United States, and had recent experience with the customer service of a mid-sized company either as a consumer (B2C), or in a business context (B2B). For this survey, 'mid-sized' was defined as any company that was not a large, well-known company or a small local or online company. The 1046 participants included both men and women. 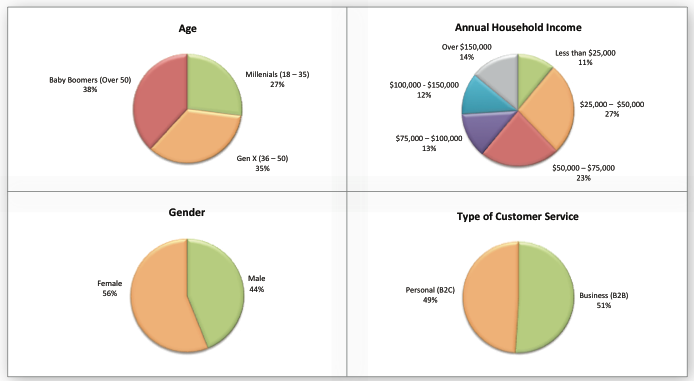 They represented a wide range of ages and household income. The survey was conducted by Dimensional Research, an independent market research company specializing in technology. The survey was sponsored by Zendesk, the leading provider of proven, cloud-based customer service software. Survey participants were not informed of this sponsorship. Dimensional Research® provides practical market research to help technology companies make their customers more successful. Our researchers have deep understanding of how technology is developed and used. We partner with our clients to deliver actionable information that reduces risks, increases customer satisfaction, and grows business results. For more information visit www.dimensionalresearch.com. Zendesk is the proven cloud-based help desk software that is the fastest way to enable great customer service in rapidly growing companies. Zendesk is so easy to use; support teams and their customers worldwide love it. More than 30,000 organizations including Adobe, MSNBC, Sony, OpenTable and Groupon, trust Zendesk with their most valuable asset: their customers. Now, organizations can deliver exceptional support across the web, email, and social media. Since the mobile device explosion having created even more opportunities to help customers anywhere, any time, Zendesk is also available across devices such as the iPad, iPhone, BlackBerry, and Android.